ANDREW LIN has starred in 32 films and 20 television series since beginning his acting career in 1997. A versatile and handsome actor who can play both hero or villain, Andrew originally worked as a special effects makeup artist in the States before coming to HK in 1996 where he befriended many local moviemakers, including Tsui Hark. His pass project in FX include alien 3 and Mimic. Andrew later traveled to Taiwan and became acquainted with the legendary director, Chu Yen Ping. While helping Chu create some of the FX custom makeup for his films, Chu’s connections won Andrew several roles in movies such as “The Blacksheep Affair” and “The Accident”. 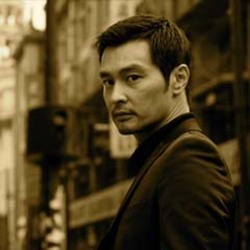 Now living in Hong Kong permanently, some of his more recently notable films include “Naked Weapon”, “Love au Zen”, “Vampire Combat”. Some earlier films are “Sunshine Cops”, “2000 A.D.” and “God.com”. While relaxing at home, Andrew enjoys designing and making sculptures and makes custom 12" figures.